La Fille de Berlin. A rose of absolute substance. A vein girl with a voracious gaze. La Fille de Berlin is the rose of dreams. A fantasy performed in a crystal clear reality. La Fille de Berlin gets what she wants. But, what does she want? She is a rose so perfectly done it radiates infinite hues of gloriously dangerous deep reds and scintillating pink tones of innocence. It pulls up in a magisterial, self-proclaimed direction, lavish in merely being itself. It is a scent that expresses a realism done to the polar extreme, somehow made better. La Fille de Berlin, she is indeed a tortured poet. A tragic character with an unmistakable resilience. However she puts on her bloodiest red lipstick at sundown in the middle of a snowing winter and is the most courageous in the room. An inviting warm aura from a distance, detracting to a fragile crystalline cold at close. La Fille de Berlin. She is the girl of dreams. And, perhaps only ever your dreams. I am terrified at attempting to describe La Fille de Berlin, simply because Serge Luten’s has already done it best: “She’s a rose with thorns, don’t mess with her” he says. When you put her on, you receive olfactory portraiture – a bouquet of velvet red roses drowned in chiaroscuro lighting, done in the severe film noir style. The floral bouquet is content on the skin for a large period of time, and it pulsates an iridescent hue covered in lashings of rich red berry jam, cinnamon, fruits, and a contrasting current of astute black pepper, pink pepper, and a twang of citrus. It tickles the nose, creates intrigue and pulls downwards as the facets stretch out more, revealing a temperamental and flamboyant fragrance pulled into order with a remarkable sense of restraint. Simply, it teases with its initial sweetness, then tortures in the sensual dry down. La Fille de Berlin is a red the colour of an open wound at this stage – for Luten’s a figurative one, wanting to symbolise the headstrong female in postwar Berlin. Her external visage is warm; her inmost depths are dark and riddled. This wound marks itself on the skin: an obvious metallic note forming the ‘rose and metal’ paradigm popular today. This impression is cold and wounded, yet moments later it is warmed with amber, incense and musks. Recalling a Luten’s style in a different context. This perfume tells a poem; a tragedy told quickly. Finishing on a raunchy base, somewhere between an indolic floral and a sweaty animalic musk, then almost toppled with spice: a hint of cumin I suspect. Just a touch. This blatant and overt contrast of a skank accord against the textured rose builds the intrigue for this scent, with its floral headiness already deeply nuanced in itself. For this reason La Fille de Berlin reminds me of an old world style of rose scent, haunting and strengthened with a prominent backbone. It is not a dirty style of musk, but a clean, human-like one in the end, pampered endlessly with vinous roses covered in an intoxicating blood. Without sacrificing itself to flirtatious or creaminess, this fragrance pulls deeply into a territory of sultry darkened roses. She’s a girl who goes to extremes. A rose for grownups. The ultimate mark of confidence for a woman, or man alike! 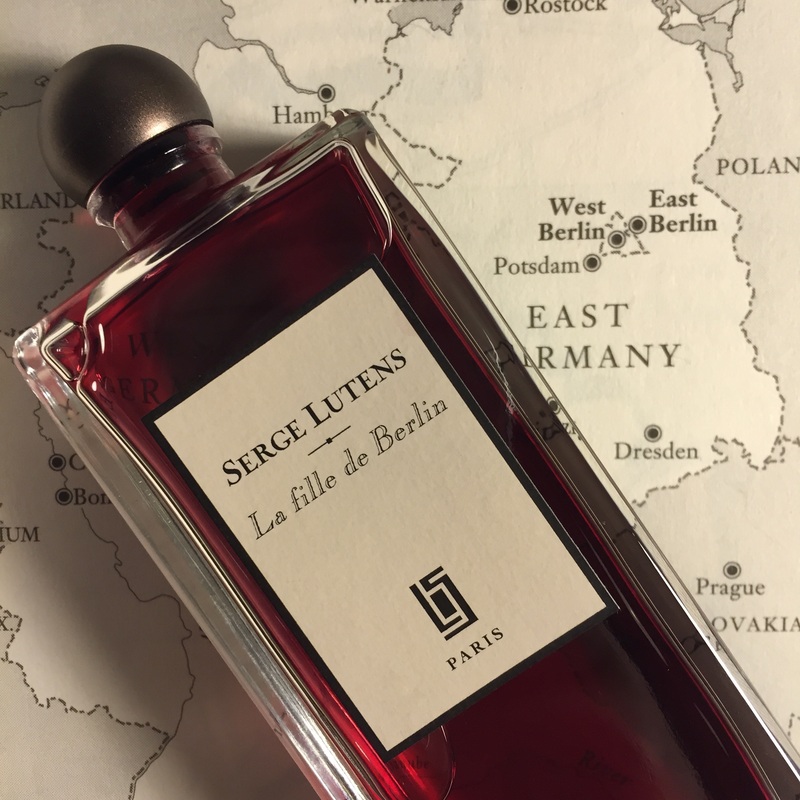 This entry was posted in Serge Lutens and tagged Berlin, Fragrance, fragrance review, French, La Fille de Berlin, perfume review, Review, Rose, scent, Serge Lutens. Bookmark the permalink. One of my favourite roses, in fact, one of the few perfumes I have paid full retail price for and pretty much bought on the spot. Luscious! What I find interesting is that everyone to whom I’ve given samples (even the “I’m not into roses” people) have all ended up buying a bottle for themselves. Love it, Liam. Now I MUST try it!